As a college football fan, I suppose I should be jumping for joy that we're finally getting a playoff system to decide the national champion. Of course, I'll be tuning in for every game because, well, I'm an insane football fan who thinks there's no such thing as too much football. But I still can't help but feel that the system devised isn't going to necessarily make things any less complicated, so much as make it more complicated. The biggest thing that gets me is we still have the interminable lay-off between the end of the regular season and when the bowls (now the playoffs) will begin. I know the argument goes that it's to protect the student athlete, but I call shennigans on that logic. Every other major sport under the sun has multiple games per week and a playoff system that barely takes into account the fact that these athletes are also students. I'd argue that football players have the potential to miss fewer days than their fellow athletes who participate in basketball, baseball or another sport. And then there's a selection committee that will look at--well, we're not exactly sure how the teams will be chosen. I can't wait for the year that we have five, six or seven undefeated teams or that some independent team or team from a lesser conference gets overlooked because a)they're schedule was full of cupcakes and b)they won't bring in the huge bags of cash that you'd get from an SEC or other big conference team. Or heaven forbid you overlook a conference champion and instead insert a more deserving and better second team from a conference. It seems to me that the playoff idea is a step in the right direction. And maybe they'll prove me wrong and this will all work out well and the new system will be a good one. But on my initial view, I've got to say I see far more potential for this thing to be an epic fail than an epic win. 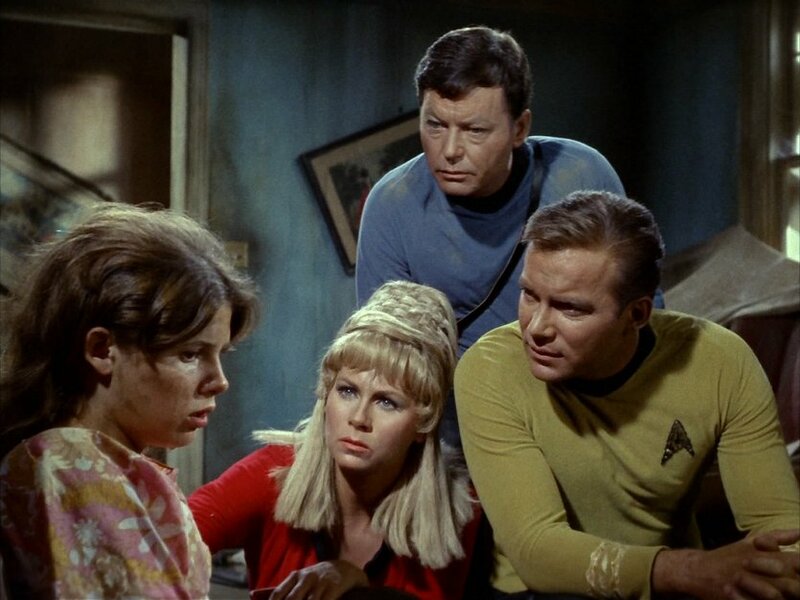 There aren't many first season episodes of classic Star Trek that I actively dislike--to the point that I'll rarely bother to watch them if I stumble across them in syndicated repeats or when I'm randomly selecting an episode or two to revisit. "Miri" falls into the camp. Returning to the episode for the first time in a long time, I'll admit there were moments during the first fifteen minutes or so that I wondered why I bore such ill-will toward this voyage of the starship Enterprise. The the first commercial break rolled around and everything went straight to hell yet again. "Miri" has a lot of potential, most of it squandered. In the teaser, the Enterprise rolls up to a planet that is an exact replica of Earth. It's even got the same continental pattern to it, which in the original version looked like the globe used in most classrooms. The remastered version has a much nicer, rendered version of our planet which we see a few times from the view-screen. The Enterprise is responding to an SOS from the planet and we can't waste much time examining the ramifications of the fact that--holy cow, we've just gone into orbit on a planet that is an exact duplicate of Earth! Turns out the exact duplicate of Earth concept is there so that we can have the crew beam down to the Paramount backlot and run about for what remains of the story. Seems that the cause of this distress signal is the society here sought to prolong their lives, only it backfired. The adults all contract some disease and die within a week, but it does extend the life of the children. The children are perpetually young (they age at the rate of one year per month) and have created a Lord of the Flies like society in which everyone plays games, has foolies and is distrustful of "grups" (or grown-ups). There's a good reason for the distrust since once you hit puberty, the hormones coursing through your system cause the virus to kill you. So, it's a race against time for the landing party to find a cure before everyone dies and goes crazy from the disease. To add to the complication, the pack of kids decide they'll steal the landing parties communicators--something they're totally successful at doing because instead of carrying them around with them, the crew leaves them in the lab and are lured outside by the children! So we may have a cure but we can't call up to the ship to make sure it's OK. Never mind that other episodes establish that landing parties have a regular rotation for checking in to the ship that should eliminate part of this problem. And never mind that we've got freakin' tricorders that can and should be able to scan and find these kids fairly easily (at least based on what we've seen in other installments). See, the script requires that we have the crew do inherently stupid things in order to keep the plot going. But we've got Miri, a young woman who befriends the landing party and has a crush on Kirk. Now maybe in the day and age of classic Trek, the idea of an older guy like Kirk flirting with a girl who will hundreds of years old is just going through puberty wasn't quite as off-putting as it is today. (Thousands thinks the whole Edward/Bella thing is OK, even if he's just an old pervert, hitting on the younger girl). Kirk clearly manipulates Miri by playing on her affection for him, getting her to take him to the children to get the communicators back and getting her to do simple jobs around the lab like sharpening pencils. It also sets off a jealous streak in Janice Rand, but she's pretty gone from the series after this installment (at least in the original production order), so the less said about it the better. Another issue arises once Kirk finds the children. He wanders in and speechifies to them about the situation, trying to use logic and one of the first big examples of Shatner-acting to persuade them to give back the communicators. Up to this point, the kids have been acting like a tamer version of Lord of the Flies, but a few passionate pleas from Kirk and they're not only giving back the communicators, they're agreeing that maybe having adults around and going to school would be a really, really good idea. It's all so frustrating on so many levels. Not just the pack of kids, but the whole squandering of a lot of really potentially interesting ideas here. The crew warps off without even questioning how a second Earth could evolve or why this would happen. At least later visits to planets that patterned themselves after Earth would try and give us some kind of explanation for how this happened, even if it ends up not making a lick of sense. I tend to watch "Miri" about once a decade or so, each time hoping it will grow on me somehow. So that means I'm good for the next ten years on this one--or until they come up with a new, cooler format for me to purchase classic Trek on yet again! 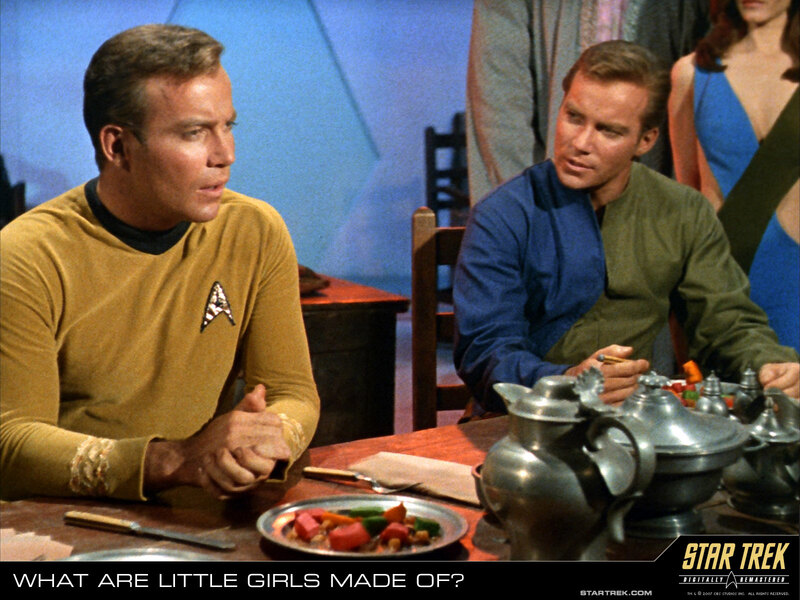 Star Trek: "What Are Little Girls Made Of?" Sometimes watching classic Trek in the original broadcast order, I find myself hoping that certain threads and storylines will make a bit more sense. For example, the back story for Nurse Chapel. Just a couple of episodes ago, she's throwing herself at the emotionally unavailable Mr. Spock, professing her love for him while under the influence of the strange virus from Psi 2000. Now just a couple of episodes later, we find out that she signed on aboard the Enterprise to search for her missing fiancee, Dr. Roger Korby (who, ironically enough, we'll also find out is emotionally unavailable, though for entirely different reasons). However in both running order and production order "What Are Little Girls Made Of?" airs after "The Naked Time." It would make a bit more sense if the episodes were reversed--at least from the character standpoint of Christine Chapel. But I guess that's not be. But beyond all that, there's really a lot that's memorable about "What Are Little Girls Made Of?" even it it doesn't quite enter the pantheon of great classic Star Trek episodes. Of course, one of the memorable moments is the costume worn by one Ms. Sherry Jackson As Shatner points out in his kiss and tell book on the making of classic Trek, costume designer Bill Theis firmly believed that less is more in terms of costumes worn by females. And no where is that more the case than in the costume worn by Jackson as the android girl, Andrea. I first saw this installment as a hormone imbalanced teenage boy and I have to say it made quite the impression. If we're being honest, it still makes quite an impression on me all these years later. But it's not just the costume that does it--it's the fact that Jackson is pretty easy on the eyes. She's helped out a lot by the soft focus that classic Trek gave many of its female guest stars during the original series run. But I'd still argue that Jackson belongs on the list of sexiest ladies ever to grace classic Trek. *It makes me wish that somehow these interviews could be included on the DVDs and/or Blu-Rays. I'm betting someone other than Paramount owns them and the price would be high. That said, I'd still love to see them again because they had some great insights and anecdotes. "Little Girls" is also the second time in the last three or four episodes that a duplicate of Kirk is wandering the ship. In this case, it's an android duplicate of him and not Kirk split into two halves. Korby does this to convince Kirk of what exactly he's found here on Exo III. Seems that Korby has found the remains of a civilization that wiped itself out after creating an apparent super race of androids. Left behind is Ruk, a guardian who has forgotten his prime directive (Kirk will eventually remind him of it) who is chief enforcer and bouncer for Korby. Korby has created android duplicates of his assistant Brown and he's created Andrea as well. Korby wants to take his androids to the galaxy, but not all at once. He's afraid of what might happen should Kirk report in on what they've found. So he holds Kirk and Chapel prisoner, creating a duplicate of Kirk to help them infiltrate the ship and find a suitable colony to take the android making equipment to. Of course, Kirk is able to get one step ahead by implanting a tick into the android to warn Spock that something isn't quite right. Luckily the android is goaded into using it while on the ship for a brief visit. The cloning of Kirk leads to the second memorable portion of the episode (and no, I don't mean the image of naked Shatner spinning on the cloning device). One chilling scene finds Kirk coming to Chapel to ask where her loyalties are and if she would betray Korby or the ship. Chapel confesses her confusion in the situation, unburdening herself to Kirk, only to find out it's the duplicate. The game is given away when Chapel asks Kirk to go ahead and eat since she's not hungry and he replies, "Androids don't eat Miss Chapel." It's chillingly effective and shows just exactly how far up the creek Kirk could be if not for his tick to warn Spock and the fact that his making with Andrea confuses her enough that she eventually shoots the android when it rebuffs her advances. And if you guessed the big twist that Korby is actually a clone as well long before anyone else does, you're not alone. That said, the episode does a nice job with Korby realizing what he's lost by transferring his consciousness to the android body and that the universe is better off not knowing about Exo III after all. Kirk apparently agrees with the line, "Dr. Korby was never really here." This is another episode that show Trek making another step forward toward hitting its stride. A lot of the episode works well and there are some minor bits that don't. But this is among the more memorable and entertaining installments of the first ten episodes classic Trek produced.